Rotarian Craig Edgington, right, won the Hillsboro Rotary’s joke contest Tuesday in an upset victory over renowned comedy maven Rob Sharp. Edgington emerged victorious after several rounds of competition involving various Rotarians telling jokes of high, medium and low quality. Edgington received his award from Rotary President Reid Sharp, left. 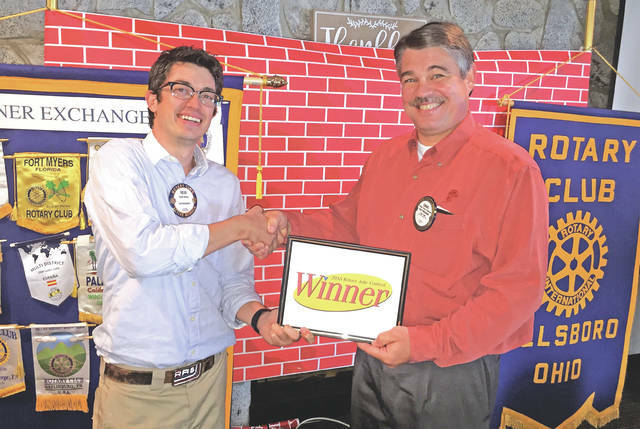 https://www.timesgazette.com/wp-content/uploads/sites/33/2018/06/web1_Edgington-Rotary-this.jpgRotarian Craig Edgington, right, won the Hillsboro Rotary’s joke contest Tuesday in an upset victory over renowned comedy maven Rob Sharp. Edgington emerged victorious after several rounds of competition involving various Rotarians telling jokes of high, medium and low quality. Edgington received his award from Rotary President Reid Sharp, left.